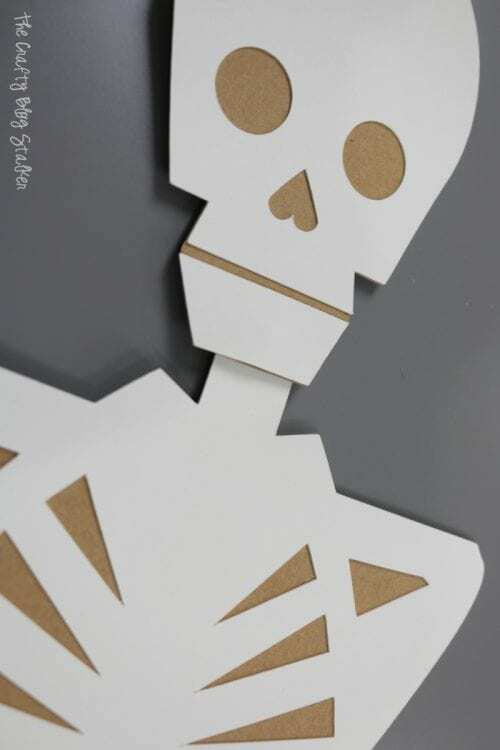 Learn how to make a Large Skeleton with the Cricut Maker and Kraft Board. Great for Halloween Party Decor! 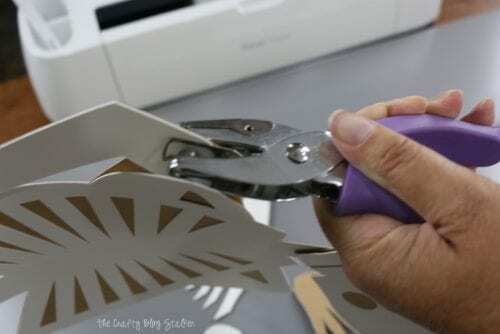 An Easy DIY Craft Tutorial Idea. This is a sponsored post on behalf of Cricut. All opinions are my own because I love giving you helpful tutorials! Do you like to decorate for Halloween? Or what about Halloween Parties? 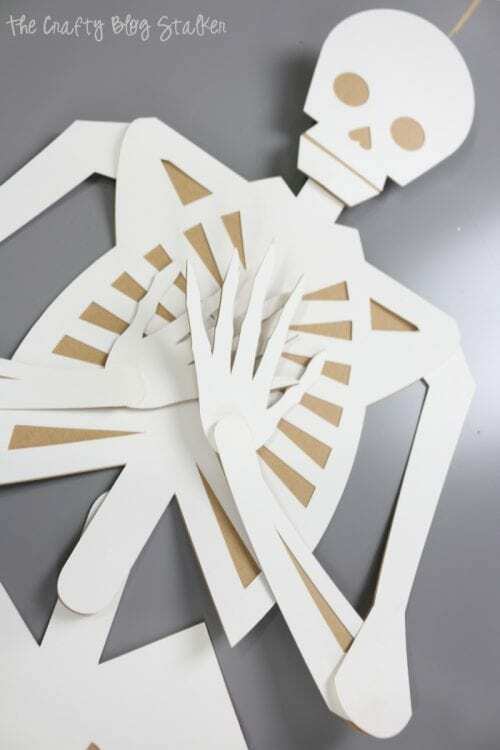 If so, you need to make this 41-inch Tall Skeleton. He is a super fun project and he is movable!! 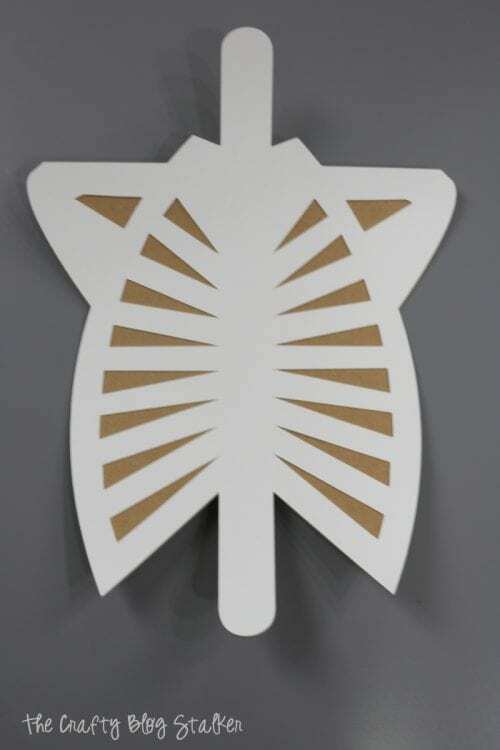 The best part is that he is made with the Cricut Maker and you can use the file I created so there is no guesswork! 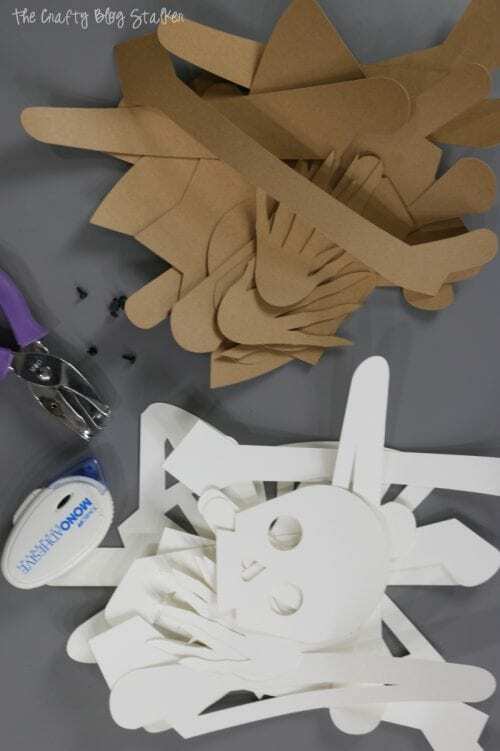 Let the Cricut Maker cut the pieces and then you assemble. Easy Peasy! 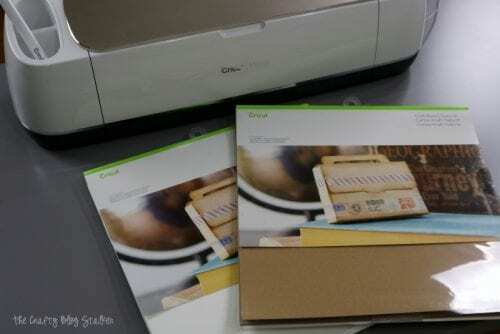 You will need to start in Cricut Design Space, which the designing program used to cut with the Cricut Maker. Once you are logged in, click on this link and be taken directly to the 41-inch Large Skeleton Canvas. Your screen may look like this if you are on a computer. But the instructions are the same whether you are on a computer or a device. From here you have two options. 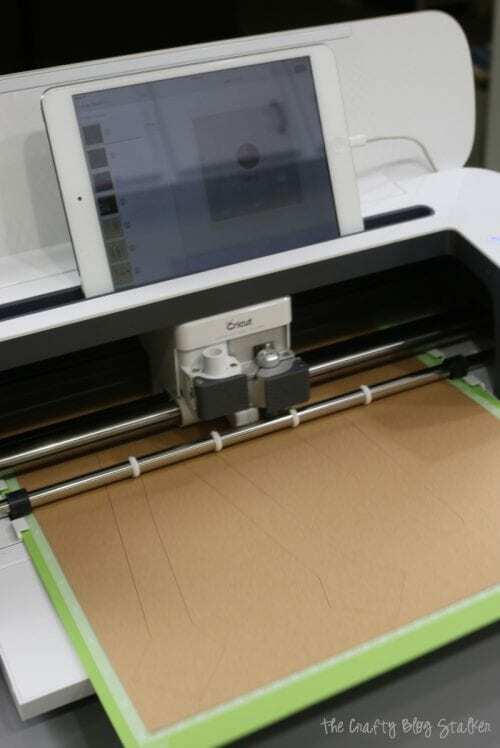 You can click on Make It and you will be taken directly to the mats to cut your pieces. The other option is to Customize. 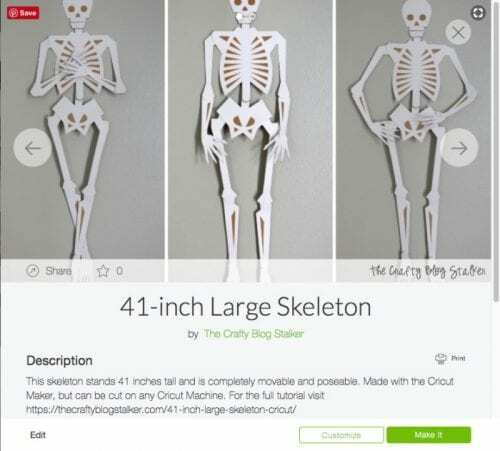 Click here if you want to change the size of your skeleton. But remember to select all pieces before you resize, otherwise, your pieces won’t match. I have sized the pieces as large as I could to get them to fit 12×12 sheets. 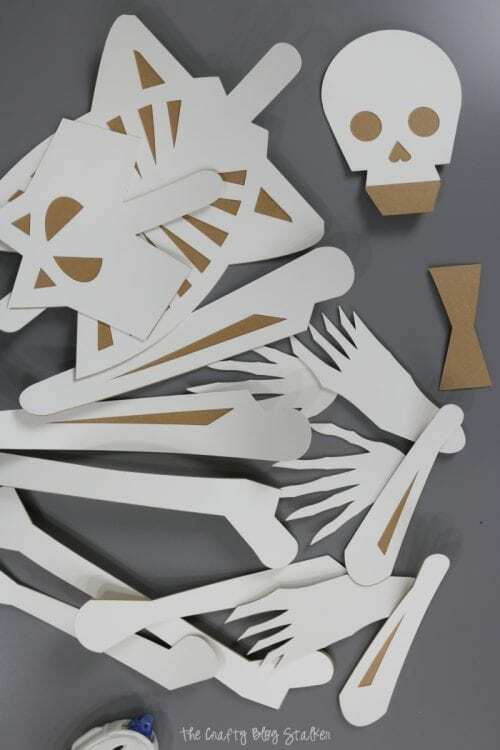 Then follow the prompts to cut the skeleton pieces out. 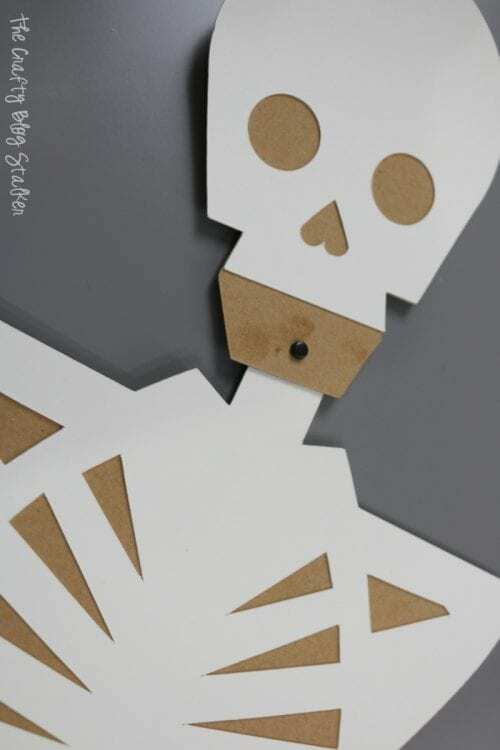 The way the skeleton is sized it requires 4 sheets of Natural Kraft Board and 4 sheets of White Kraft Board. 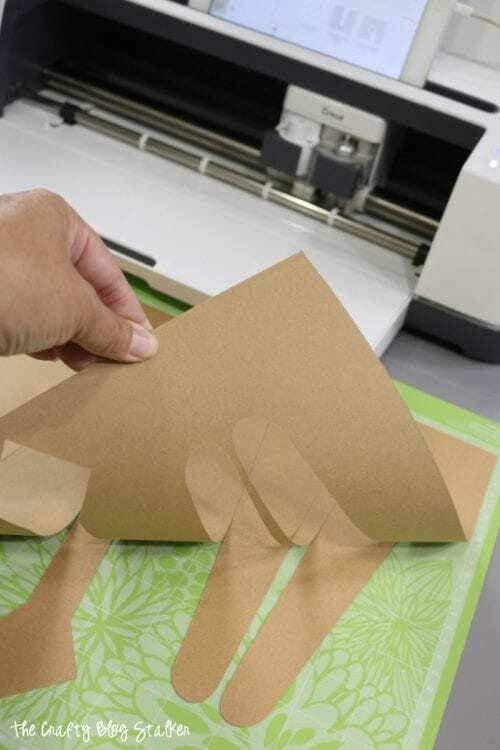 When is each sheet is done cutting, carefully peel away from the mat. Careful not to touch the sticky parts of the mat. You don’t want the oils from your skin on the mat because then the sticky won’t last as long. You can use the weeding tools like the spatula shaped one to remove the little pieces from the mat. Keep the pieces separated by color. This makes it easier to match them up and make sure you don’t miss any. 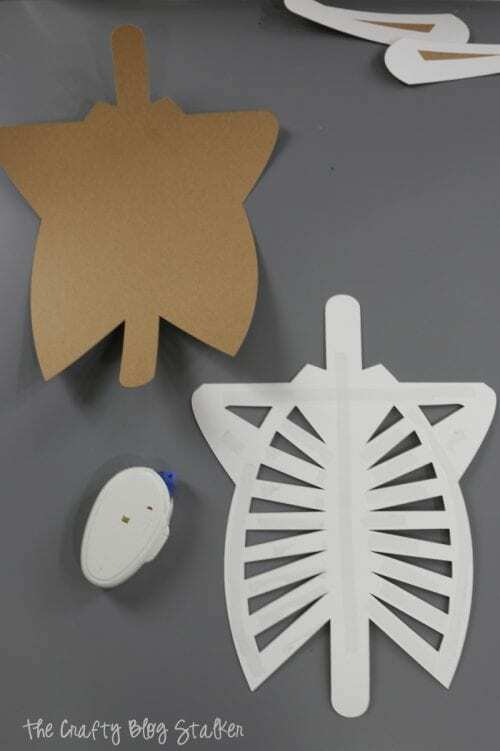 For each bone piece, there is a matching white and natural Kraft Board piece. Apply adhesive to the back of the white piece. Do not put the adhesive where the joints are. This is where we are going to put the brads and we want to make sure the joints stay movable. Center the white piece over the natural piece and apply light pressure so the adhesive sticks to each piece. Here you can see where I left the joint adhesive-free. Most pieces have two joints so the easiest way to remember it is to just apply the adhesive to the center part of the pieces. Layer all of the pieces except the skull. Do not adhere the bottom portion of the skull just yet to the natural piece. Here is my pile of bones! It looks cool already! Now we begin punching holes and using the brads to connect the pieces. I started with the head and moved down. Place the head where you want it centered on the neck and hole all of the layers together. Insert a brad and open the tongs on the back to secure into place. Now you can adhere the bottom piece of the skull into place to cover the brad. Moving down the body, the next piece to attach is the arms. Slide the top bone of the arm between the white and natural layers of the shoulder. Position in place and punch the hole and then insert the brad. By putting the brad in the middle you can’t see them and they are hidden! Continue down the skeleton securing all of the joints with a brad until your bone pile is a complete skeleton! Isn’t he so cool! I am kind of in love with my new skeleton and I love how big he is!! I also love that he is posable and can be arranged into all sorts of positions! 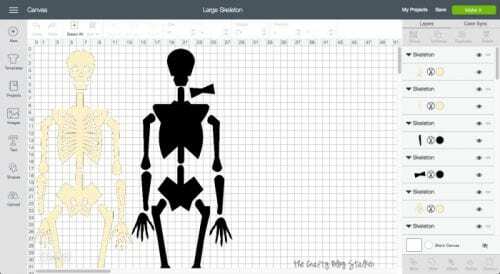 How will you use your 41-inch Tall Skeleton? For a Handmade Halloween or something completely different? Share and let us know in the comments! 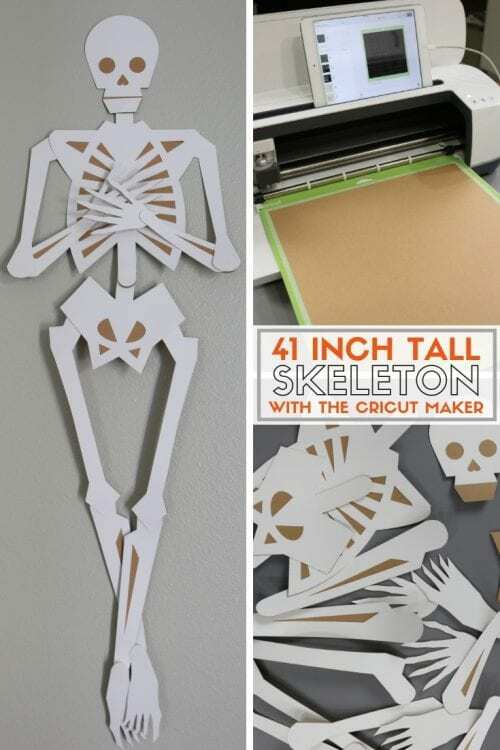 SAVE HOW TO MAKE A 41-INCH SKELETON WITH THE CRICUT MAKER TO YOUR FAVORITE PINTEREST BOARD!